Larger Blue Flag Iris (Iris versicolor) is the most common native species of iris in my area. I often see it in bloom in wetlands during late spring walks. 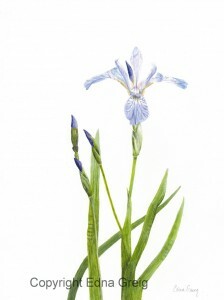 I also have a small patch of Larger Blue Flag Iris growing near my garden pond. This drawing was done in winter from photographs that I have taken.